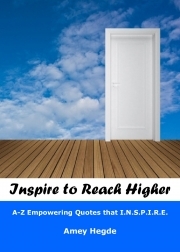 Description of "Inspire To Reach Higher: A-Z Empowering Quotes That I.N.S.P.I.R.E. (eBook)"
Amey Hegde is an Internationally Certified Corporate Behavioral Trainer, Motivational Speaker & Management Consultant. Amey’s academic qualifications include Post Graduate Studies in Behavioral Sciences Training & graduate studies in Electronics & Telecom Engineering from Goa Engineering College. He has also been trained by eminent faculty from IITs, IISc Bangalore & SIBM Pune in areas of technology & management. Amey has been trained to use international concepts of Edward de Bono’s Six Thinking Hats® and Lateral Thinking™, Facilitation Skills to Crestcom® standards, and Neuro Linguistic Programming (NLP). He is also certified to administer and debrief the internationally acclaimed psychometric assessment Thinking Pattern Profile™. Amey has over eleven years of work experience in several MNCs & Fortune 100 companies in Europe and India with a varied cultural exposure while working with teams from USA, Canada, Germany, Japan & China and before stepping out into the entrepreneurial training field, was last working at Wipro Technologies, Bangalore. Amey has trained thousands - Directors, GMs, plant heads, senior HR managers, trainers, executives, teachers, doctors, professionals, entrepreneurs and students from hundreds of organizations on various topics to enhance their personal & professional productivity. Amey has also conducted training needs identification & analysis programs, one-on-one coaching interventions and psychometric assessments for various employees. Reviews of "Inspire To Reach Higher: A-Z Empowering Quotes That I.N.S.P.I.R.E. (eBook)"